Appliance Warehouse of America makes washer leasing and dryer leasing convenient for everyone. With washer dryer leasing services available nationwide, we are America's largest supplier of washer dryer leasing. Month to month washer leasing and dryer leasing services are provided for multi-family apartment communities, as well as individuals. Appliance Warehouse offers high quality Whirlpool full size sets, stackables, and portable units for washer dryer leasing. 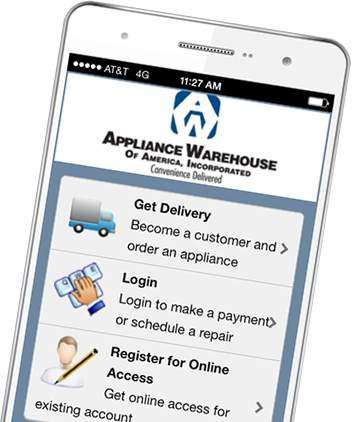 With great features like on-line account management, on-line payments, free service, and convenient lease terms available to fit everyone's needs, you're sure to find what you are looking for at Appliance Warehouse of America. Our Customer Service department is available to assist with washer leasing and dryer leasing from 7:00 am to 7:00 pm Central Standard Time, Monday through Friday. At Appliance Warehouse of America, washer and dryer leasing is always convenient and your satisfaction is our highest priority. If you are a community looking for washer and dryer leasing, please call us at 800-693-4343 for a program customized to meet your needs. If you are an individual looking for washer and dryer leasing call or click above to order your washer and dryer today. If you are a community looking for washer dryer rentals, please call us at 800-693-4343 for a program customized to meet your needs. If you are an individual looking for dryer or washer rentals, call or click above to order your washer and dryer today.